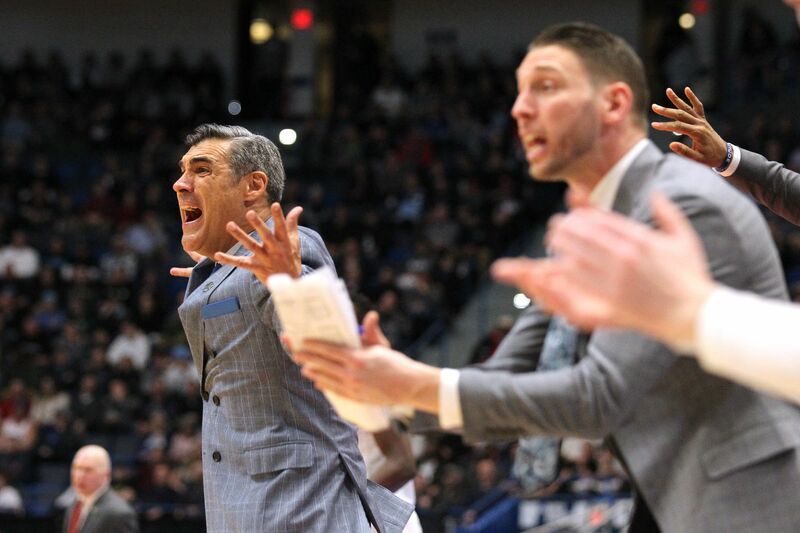 Coach Jay Wright, left, and Mike Nardi of Villanova plead for a foul call against St. Maryâ€™s during 2nd half action in a first round NCAA Tournament game at the XL Center in Hartford, CT on March 21, 2019. HARTFORD, Conn. – The horn sounded, the referee took the ball to midcourt for the opening tip, and everything was in place for a great start to the NCAA Tournament…with the exception of a crowd. When Villanova and St. Mary’s went to the floor to begin their journeys on Thursday evening, it looked like a game being played between teams in a witness-protection program. With the exception of the ushers, almost no one was in the stands. If you took away the brassy blare of the pep bands, the XL Center could have passed for a library reading room. Wright means that the unexpected is what has to be expected in this tournament, and for teams that have been there, the advantage is obvious. Phil Booth played in his 17th NCAA Tournament game on Thursday – and a program record 147th of his career – and if there was a question of which player would carry the team through, he answered it with 20 points and six assists in the gritty, not pretty 61-57 win. In a game against a disciplined opponent that doesn’t give anything away, the Wildcats scored just five points at the free-throw line. Booth had all of them, and against a team that cherishes the ball, Booth had two of his team’s three steals. Eric Paschall, the other senior, who transferred into the program for his sophomore season, played in his ninth NCAA game against St. Mary’s. He was the second-leading scorer with 14 points, meaning that he and Booth combined to score more than half of the team’s total. The empty stands that greeted the game weren’t a reflection of interest. The afternoon session, which is ticketed separately, ran very long as the day’s opener, Vermont vs. Florida St., dawdled along and the next game, Marquette vs. Murray State, was pushed back. Once the second game ended, the arena had to be cleared before the next crowd could be admitted, and all of those folks had to pass through security checkpoints before they could get in. As it was, the Villanova game was pushed back 20 minutes, but time, tide and television programming doesn’t wait long for anyone. The red light went on the TBS camera and the game was on. It was different, but the Wildcats have seen different before at this time of year, even sophomores Collin Gillespie, Dhamir Cosby-Roundtree and Jermaine Samuels, who mostly watched a year ago, but took it all in. St. Mary’s was able to do what it does best and that is to shorten the game by slowing it down. The Gaels use all of the shot clock and they force opponents into halfcourt offense by getting back to protect the rim and prevent transition baskets. A low-scoring game is usually a close game at this level, and St. Mary’s led by two points at the half, as they outrebounded the Wildcats and played very efficiently. Villanova went up by seven points early in the second half, but couldn’t prevent scoring lulls when outside shots didn’t fall and they couldn’t buy an offensive rebound. It was still a four-point Villanova lead with less than six minutes to play, and St. Mary’s had the ball twice in the final possessions down by just four points. But the upset that happened in the second round of the 2010 tournament when the Gaels outlasted Villanova wasn’t going to take place again. And they were, because they have discipline, sure, but because they have the experience to back it up. It doesn’t matter what the opponent does, Villanova has probably experienced it before. It doesn’t even matter if the stands are empty – they eventually filled up – because the Wildcats aren’t here to look around.